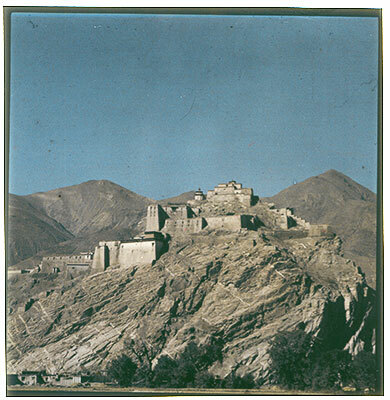 The fort of Gyantse dzong perched on a hillock. Other Information - Background: Richardson mentions this site in High Peaks, Pure Earth , London: Serindia Publications, 1998, p. 325, " ... the thriving town of Gyantse (Rgyal-rtse) (1936-50), well-placed for trade with both Shigatse (Gzhis-ka-rtse) and Lhasa and on the route to India. It is rich in art and architecture of the fifteenth century created by the Gtsang prince,Rab-brtan kun-bzang 'phags-pa. He enlarged and embellished the temple founded by his father near the rdzong which crowns the summit of the great rock overhanging the town. But his greatest achievements were the enlargement or virtual reconstruction of the Dpal-'khor Chos-sde temple and the building of the magnificent Sku-'bum mchod-rten (1936-50). The former is the heart of a community of monastic college residences spread over an extensive hillside enclosed by a fortified wall. Although the Sa-skya-pa scholl originally predominated, all other religious schools were represented here." The Tibet Album. "Fort of Gyantse dzong" 05 Dec. 2006. The Pitt Rivers Museum. <http://tibet.prm.ox.ac.uk/photo_2001.59.8.76.1.html>.